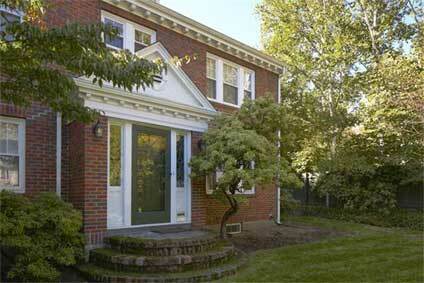 Elegant, classic 9-room brick Colonial in the prestigious Larchwood neighborhood. Welcoming foyer with marble floor leads to an office and a handsome front-to-back living room with FP, beamed ceiling and French doors. Gracious formal dining room with wainscotting. Renovated eat-in kitchen with custom painted birch cabinetry, granite counters, stainless steel appliances, and glass sliders leading to a large private deck and landscaped, fenced yard. The second floor has an alternative master bedroom with en suite full bath, two additional bedrooms and full bathroom. Entire third floor is a sky-lit, tree-top master BR suite with sitting area, lovely full bath with skylight; good ceiling height and closets aplenty. Family room in lower level, plus laundry room and extra storage. Oversized two-car garage with driveway parking. Enjoy the walking/jogging paths of Fresh Pond; the quietude of The Larches; the shops and restaurants of Huron Village and Harvard Square. A truly special offering! Lot Size: 7,333 Sq. Ft.